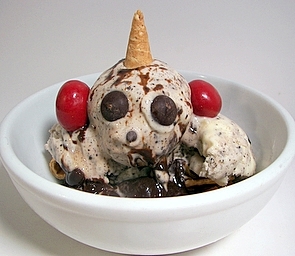 Last night, Jeff asked if I would make him an ice cream sundae for dessert... I obliged, but we couldn't do anything ordinary here right? I was just being silly and having fun putting something together, but then he said we had to snap a picture of it and put it on the website. It was just some crushed oreo and vanilla ice cream topped with hot fudge, chocolate covered dried cherries, a crushed up sugar cone and a few bittersweet chocolate chips. He had to have a picture... so here it is - happy now? 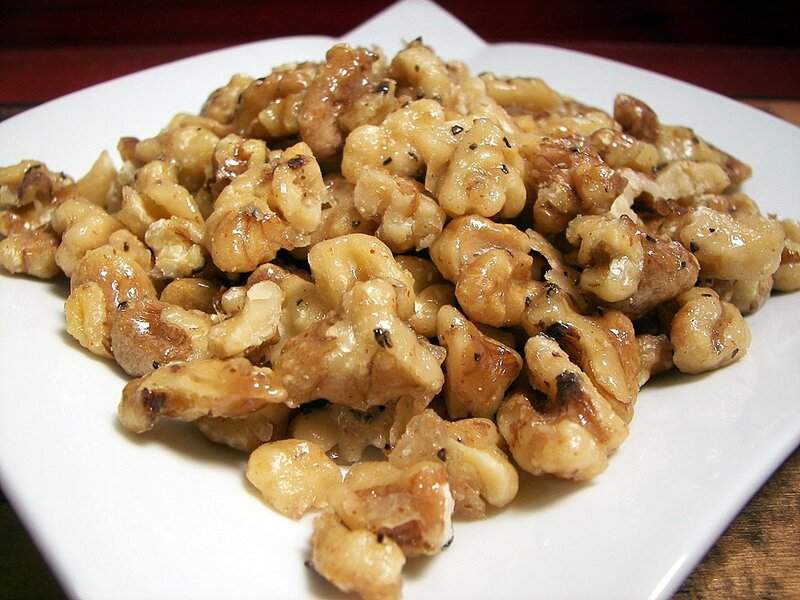 I mentioned yesterday about some Candied Walnuts we threw on a salad I made up at Jeff's Mom's house. Sweet, spicy, crunchy and nutty - these only take about 15 minutes to make and are quite addictive. Covering the walnuts is a mixture of brown rice syrup, sugar, salt, pepper and a pinch of cayenne for heat. If you don't already have brown rice syrup - feel free to use light corn syrup. I just usually keep the rice syrup on hand and prefer to use it. I still have a couple recipes to post about and catch up on since we had such a hectic week. We had this Tangelo Pork Stir-Fry earlier and I am still thinking about it how good it was. I never really paid much attention to tangelos before, but I will now and it is just beginning to be the season for them! They are a cross between the smaller tangerines and larger pummelos - the fruit is sweet with a surprising amount of juice in them! 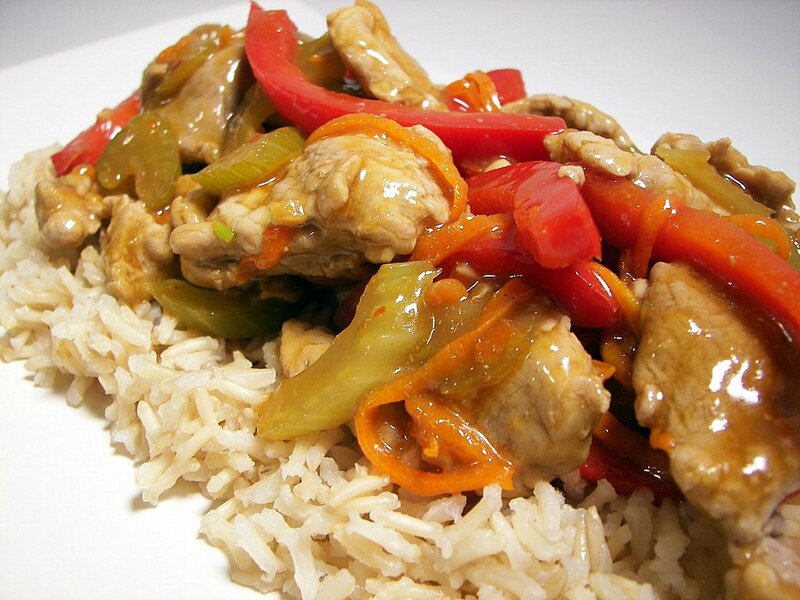 You use the zest and juice in the recipe, getting a double shot of flavor in the stir-fry. I used a citrus zester to easily remove the zest, but you could use a vegetable peeler and then cut the them into strips. Thinly sliced pork tenderlion is first quickly cooked in toasted sesame oil, followed by shallots, garlic, fresh ginger and crushed red pepper. Sweet red bell peppers and crunchy celery are then added to cook just until crisp-tender with the tangy tangelo juice and salty soy sauce added in afterwards. Vinegar and cornstarch are whisked together and added in to turn the liquids into a thick glaze that coats the vegetables and strips of tender pork. Since there was a bit of extra sauce, I served this over floral-scented brown jasmine rice. We have a portion left in the freezer and I'm sure we are going to fight over who gets to have it for lunch this week! 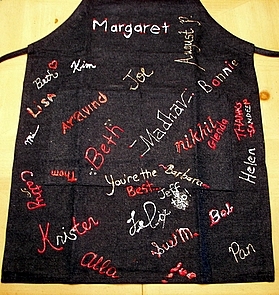 *If you happen to own/run a Bed and Breakfast - would you mind sending us a note? You can find the link to my e-mail on the upper right hand side. Thanks! We drove up to Jeff's Mom's house on Thursday (hence the missing post yesterday) and drove back home this morning. I opted to cook dinner for her last night and ended up choosing the Lasagna Soup that we had liked so much before. So simple, yet so delicious - I served it with a light salad of mixed greens, a reduced apple cider vinaigrette, shavings of a sharp cheddar cheese, fresh pears and candied spicy walnuts (I'll post about these later... we could not stop eating these nuts). Before we left, we wanted to bring something to snack on for the long drive up to PA - Jeff suggested we do a biscotti since we knew his Mom would like that. 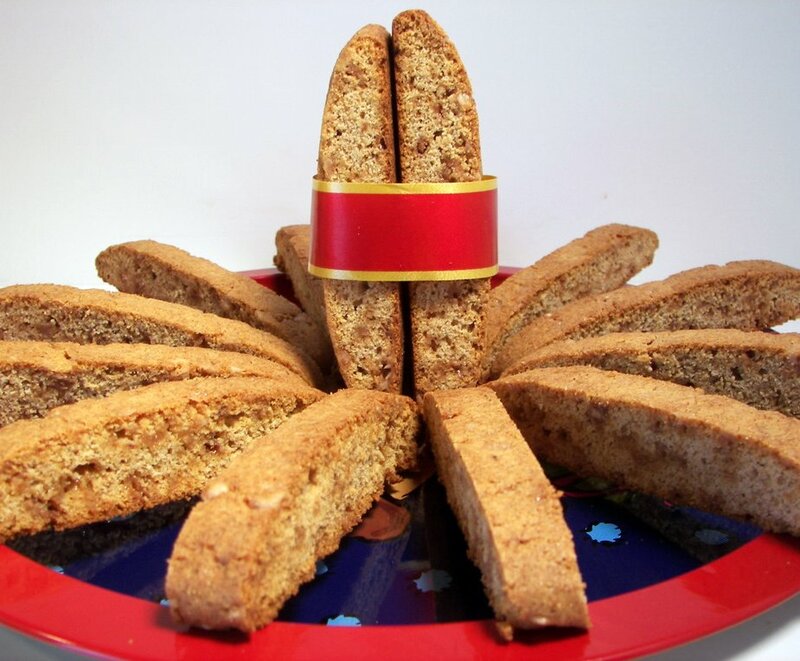 I looked through what is quickly be coming a trusty new cookbook, King Arthur Flour Whole Grain Baking, and picked out a recipe for Butter Brickle Biscotti. Most of our other biscotti recipes on the site are a more classically hard and crunchy, but this version includes butter in the base, so the resulting cookie is a little more tender. 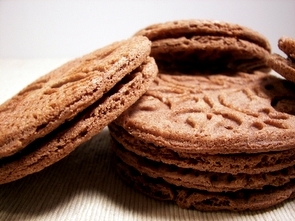 Don't get me wrong though, they still have a nice crisp texture - just a little softer towards the center. I mixed in some white whole wheat flour just to add a little lightness instead of using all whole wheat - however, I am sure they would be just as good if you didn't. 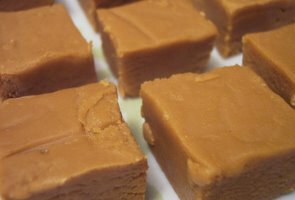 These sticks are also a bit sweeter - included in the dough are hard toffee bits that melt into wonderful caramel-esque sticky pockets throughout each slice. I was intriged by a method this recipe uses for slicing the log - it calls for spritzing the biscotti loaf as it cools... when doing this, I got ultra clean cuts without having any crumbling. I will have to try this out on other recipes to see if this was a fluke or if it really makes a difference! The dough for this recipe is also quite sticky, but don't try to fix that with extra flour - just lightly wet your hands and fingers as this will keep the dough off you and on the log when shaping. By the time we left, the three of us had made a very large dent in the supply - buttery, crisp and can be thoroughly enjoyed dunked or on its own. I saw a cake recipe a few weeks ago that I wanted to make before the holidays, but between all of the gift baking, shopping and vistors I never got around to it. 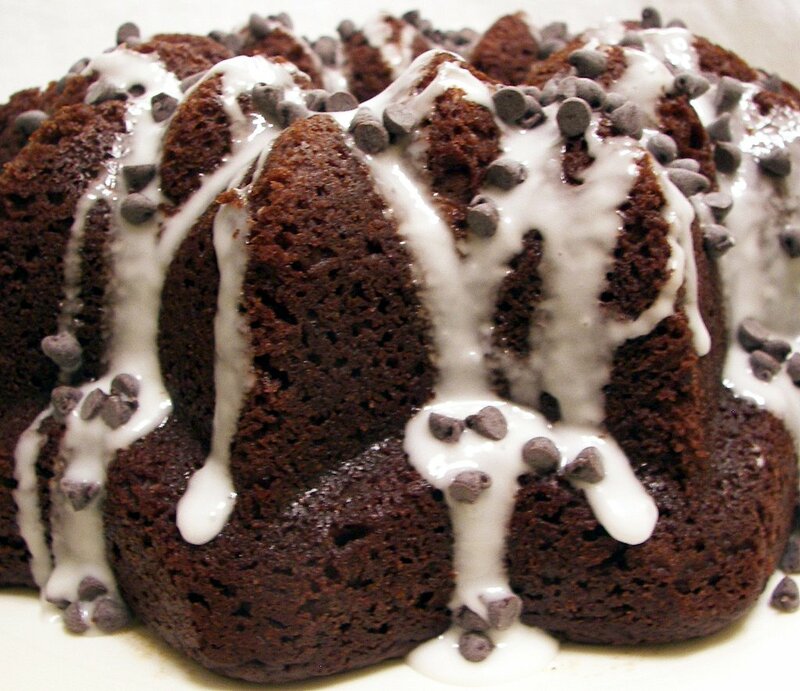 This Glazed Chocolate-Pumpkin Bundt Cake would have made for a fine Thanksgiving dessert, but I think it could also be a refreshing change to an ordinary chocolate bundt cake you may make any time of the year. Instead of using a lot of oil, this cake stays exceptionally moist from the use of mashed pumpkin. Besides making the cake much lighter, it also lends a mild pumpkin flavor in the background which compliments the spices used. You could use pumpkin pie spice, but I like using the individual spices as I find it adds a touch more oomph. While the original recipe calls for light corn syrup, I used Lyle's Golden Syrup instead - besides adding sweetness, it brings a caramel/burnt sugar depth to the cake. Buttermilk is used for tenderness and brought an enjoyable tang. Wait until right before you wish to serve the cake to make the glaze, made simply from confectioners' sugar and buttermilk. 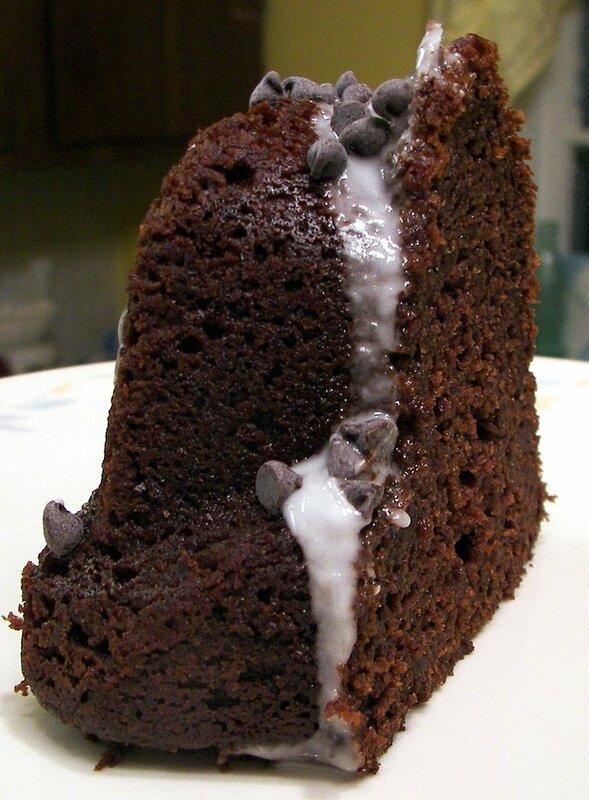 If you drizzle it on too early, the cake may absorb the striking contrast between the dark cake and the light glaze. For a fun garnish, mini chocolate chips are sprinkled on top right after the glaze is drizzled so they have something to stick to - toasted chopped nuts would also be an appropriate choice. We've made chilaquiles before, but this one swaps out a few ingredients and was a bit more filling due to the addition of shredded chicken. Instead of using an enchilada sauce, this recipe for Black Bean and Chicken Chilaquiles calls for a mixture of chicken broth and salsa de chile fresco - a spicy Mexican style tomato sauce. I had a hard time finding this, but I might have been looking in the wrong place... I finally located it after looking in a few stores and found out that the common brand is from El Pato. 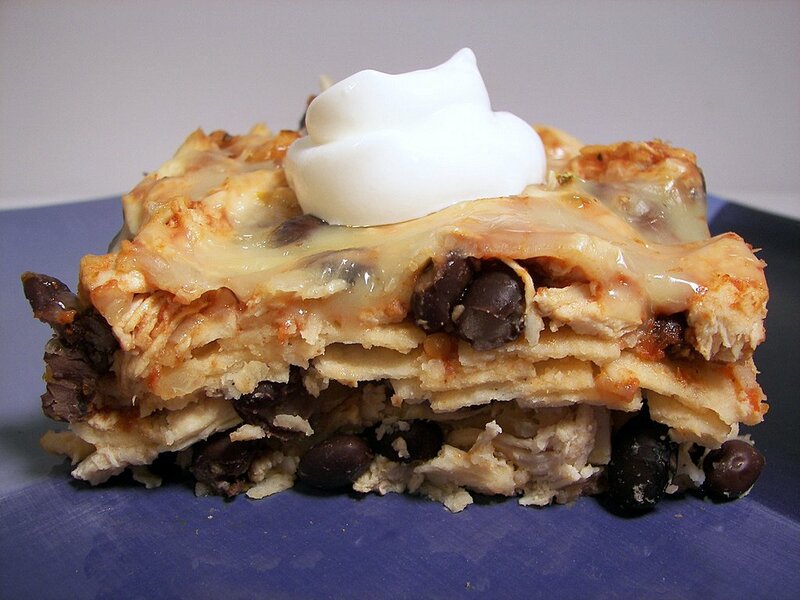 This dish is made from layers of white corn tortillas, a mixture of onions, garlic, shredded chicken, black beans and the broth/salsa combination. Before you set this in the oven to bake, a generous coating of queso blanco is added on top. This is a mild fresh white cheese that stays soft and creamy when heated - if you have trouble finding this, you could use a farmers or pot cheese but that may change the intended flavor a bit. As long as you let it rest for a few minutes, it can be cut into clean squares. We did think it could have used a bit more heat and some cilantro... but, we ended up topping our portions with just a dollop of sour cream for a cool tangy bite. Things are finally getting back to normal around here following the busy holidays and we are finishing up the last of the "projects" around the house. Between painting downstairs and cutting tile today, we were not left with a large amount of time to get dinner together. Tonight I opted for a very quick recipe that can be thrown together in minutes. We've been having good luck with quinoa lately and tonight's dinner of Quinoa Medley with Beans and Corn didn't let us down. 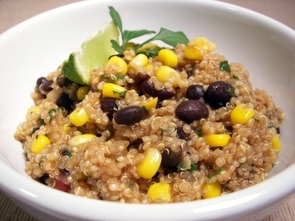 Since quinoa only takes about 15 minutes to cook, we were able to get this dish from stove to table in just around 20 minutes. As it cooks in a vegetable broth and water mixture, we quickly put together the black beans, corn, habanero salsa and chili powder. When the quinoa had about 5 minutes left to finish, the above ingredients were added in to warm up in the simmering mixture. Fresh cilantro, olive oil and a bit more of the chunky spicy salsa are stirred in right before serving. Since the quinoa is fairly mild, the salsa is a main flavor component to the dish, so make sure to choose one that you really enjoy. 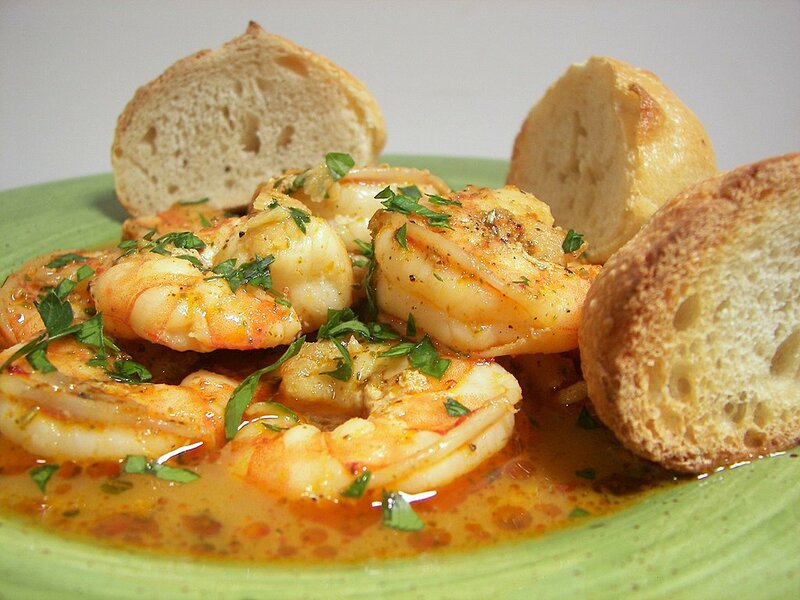 Serve with a slice of lime to freshen and tie the flavors together when squeezed over the top. 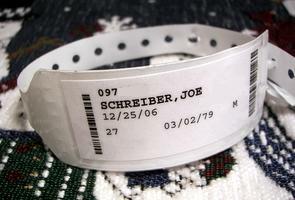 Thank you for all of the well wishes after the emergency room trip yesterday! I had some upper back/chest pain which had made it difficult to breathe since Sunday morning. They did all sorts of scans and tests, but in the end did not come up with much! Boo! While I'm glad they didn't find anything serious, it makes me wonder what they missed. We did learn one tidbit though... apparently I have a low resting heart rate, as every nurse/doctor pointed out. The resting rate was around 40 the entire time and I gather it is because they consider me "athletic" from the weight lifting, cardio exercise and general healthy lifestyle we live. Interesting enough I guess! After I rested a bit, I did actually get dinner together last night. I had picked out a recipe from a new cookbook I received (thanks so much Gail and Mike) and glad I got back in the kitchen to make it! There was not much prep work to do for the recipe, Becker Barbecued Shrimp, so Jeff was happy to hear he didn't have to do anything! A spice mixture composed of rosemary, oregano, crushed red pepper, sweet paprika, black peppercorns and salt first ground in our handy spice grinder - if you don't have one, feel free to mash it together with a mortar and pestle. We toasted these spices with a few cloves of garlic in a skillet of plain ol' melted butter until the spices let off a sweet aromatic fragrance. Shrimp are then slipped into the dark bubbling pool, stained from the variety of spices, to gently cook until they turn a light pink and are almost done. The shrimp are then picked out of their juicy playground to allow for the addition of chicken broth and amber ale. This boils and reduces to intensify the glistening liquid to create a sauce worthy of a few hunks of toasted sourdough bread to dip. The sauce is finished off with fresh parsley and brightened up with a splash of lemon juice. The tender juicy shrimp were just spicy enough for us - however, the sauce was almost the star of the dish and we had to fight over who got to mop up any leftover drops. Merry Christmas and Happy Holidays 2006! I hope everyone is able to enjoy their day with friends, family and loved ones! Unfortunately we spent 6 hours in the emergency room this morning, put up with 5 tries at getting an IV and dealt with a variety of tests - we had to change our plans for today. I'm going to go take some medicine and relax to see if I can still get dinner together tonight - but we should be back to posting as normal as we can tomorrow! 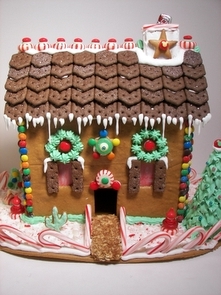 I mentioned a few days ago that Jeff thought we should decorate a gingerbread house this year - here are a couple pictures of how it ended up! This was our first time ever doing something like this - it was sure fun and not too tough to put together. I also did an oblong gingerbread base for it to sit on... but now I wonder what we are going to do with it (it is all 100% edible, but Jeff wants to save it)! Do you end up eating yours, saving it or tossing it to the birds? And for you clever Disney fans, be sure to look for some hidden Mickeys! Merry Christmas and Happy Holidays from Jeff and I! We usually keep a homemade doggy treat supply in the garage freezer and pull out a handful to keep in the refrigerator - but, someone forgot to tell me we were out! Since we've been making quite a few treats for the human-types, we figured we better get something made for the pups too! Unlike previous treats we've made, these Cinnamon Apple Snaps do not need to be rolled out. 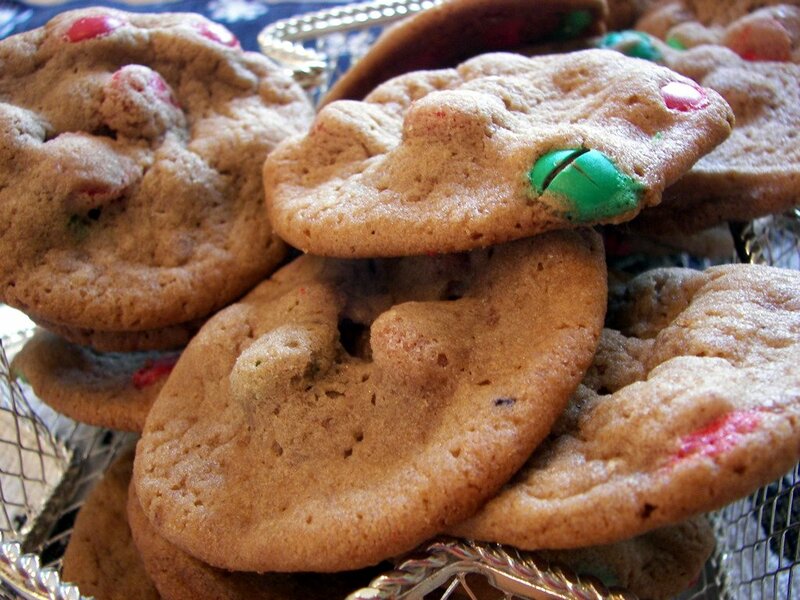 They are simply scooped out and flattened with a glass like you would a sugar cookie. 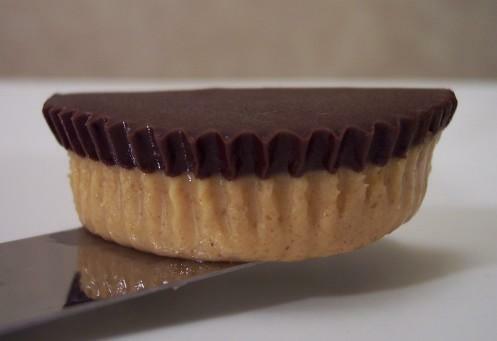 Instead of dipping the bottom of the glass in sugar to prevent sticking, we used whole wheat flour. These snaps are made from whole wheat flour, rolled oats, cinnamon, a minced tart apple and bound together with water and orange blossom honey. In the recipe, I mentioned you may need additional flour - you want the dough to end up being fairly stiff, but still a little sticky. Start with 1 1/2 cups and add until you get to that consistency. These will not spread much and you can place them fairly close together - I was able to fit them all on two large cookie sheets. You can make these as big or as little as you want - just adjust the amount you scoop out to the size of your pup. I think it would also be fun to roll these into little balls and use them for training treats too instead of flattening them into bigger discs. 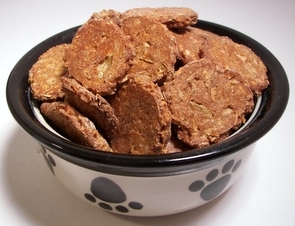 Max and Spike gave them two and a half out of three paws - I have a feeling they were expecting me to dip these golden crispy snaps into some melted puppy-safe carob chips just like the big kids got! I'll remember that for next time guys! Ever since we tried fennel for the first time earlier in the year, I've been keeping my eyes peeled for recipes that sound like we may enjoy them. Tonight's dinner, Risotto with Fennel and Peas, is perked up in two ways with the flavor of anise - one from the fennel and another from Pernod, a licorice-flavored liqueur. As long as you have the time to stick around the pot to stir, this really takes a minimal amount of effort - just some chopping of the veggies and grating of sharp Parmesan cheese. 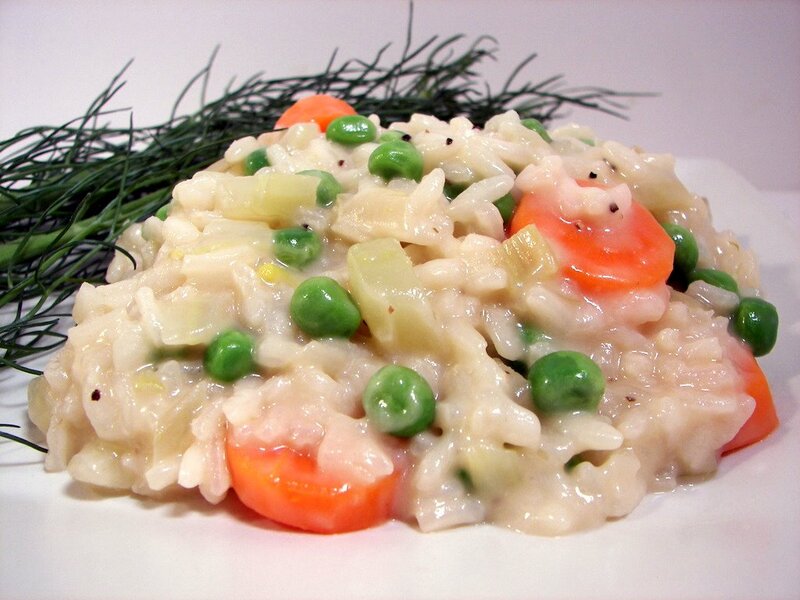 Frequent or constant stirring of the risotto is key to getting that luscious creamy texture, along with using arborio rice - a short grain rice that is quite starchy. Be sure to remember not to rinse this rice as you don't want to wash off the needed starch! The recipe calls for 5 to 6 cups of warmed chicken broth - I ended up using a little under 5 cups as the rice was just tender with that amount. With two cups of fennel and the shot of Pernod, I was expecting a more in-your-face anise flavor, but it was not as strong - it was more like a gentle bite with a light sweetness. I liked how we cooked the carrots separately; this way you can control how tender they get. I left them in the water for just under 2 minutes. They had just enough give to them, but were still pretty firm - Jeff is not a fan of mushy veggies! I know I said I was done... but I couldn't help myself! 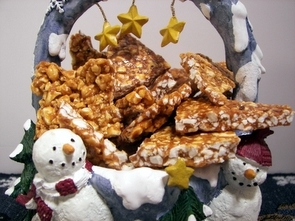 I thought of a Christmas goodie that Mom would always make this time of the year. Now, I have not had one of these in forever and I'm not sure what made me think of them, but I just had to try and make a batch on my own! 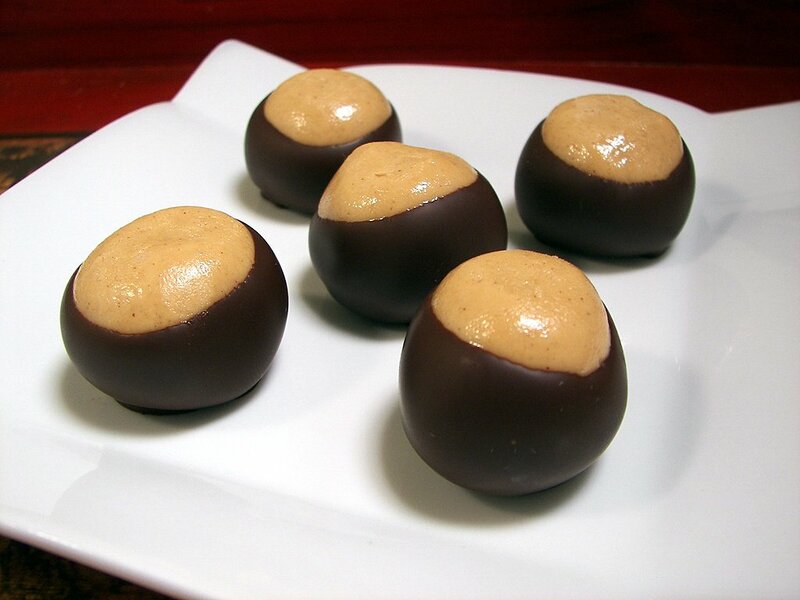 I remember Mom having to hide Peanut Butter Buckeyes as soon as she made them... I made sure to put a dent into the supply laying around. These sweet peanut buttery balls are just smooth peanut butter mixed with confectioners' sugar, melted butter, a dash of vanilla and a pinch of salt since we used unsalted butter. The dough is not sticky at all, so if you have little helpers around, make sure to recruit their help to roll the mixture into balls! To create the "buckeye", they are dipped into melted bittersweet chocolate - to ease the dipping, be sure to refrigerate or freeze the balls until they are quite firm before starting. For quick and clean dipping, use a toothpick placed in the center of each ball. A lot of recipes for this candy call for melting the chocolate with paraffin wax - if you used this, it would make the chocolate a little thinner, more stable and would prevent them from melting from the heat of your fingers as you eat. Now - I prefer to use tempered chocolate rather than trying to use wax, but since I was only making a small batch, I just used good-quality chocolate that I chunked up and slowly melted. Besides, these were just for us and I'm perfectly okay with licking my fingers clean of any chocolate that may melt on them! Dinner tonight, Leek and Potato Fritters with Lemon-Cumin Yogurt, gussies up those refrigerated pre-shredded potatoes you can find in the stores lately. I'm sure you could always par-boil your own potatoes and shred them, but I took the easier route tonight! To top these fritters, a yogurt sauce is made by first draining some plain yogurt in paper towels to ensure a thicker sauce. I like this method as it only takes about 5 minutes and it adds body to the sauce. Don't worry about the yogurt sticking to the paper towels - it can be easily scrapped off. Garlic, lemon zest and cumin enhance the tangy yogurt with a stimulating flare. 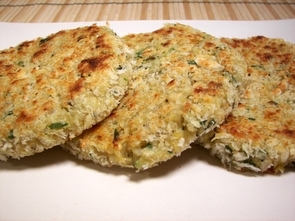 Adding flavor to the fritters begins by cooking thin sliced leeks until they begin to turn golden. They are mixed with the pre-shredded potatoes and then bound together with a couple whole eggs and egg whites. Using only a tablespoon and a half of canola oil per group, the fritters are quickly fried until both sides are a crisp golden brown. Because this makes 16 medium-sized fritters, it needs to be done in two batches - to keep the fritters warm while the others cook, place them on a baking sheet and set them in an oven set at 250 degrees. 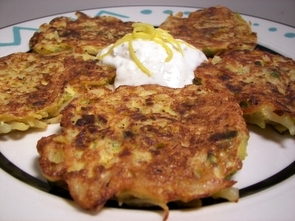 The creamy sauce complimented the mildly seasoned fritters and helped to keep them from feeling too heavy. 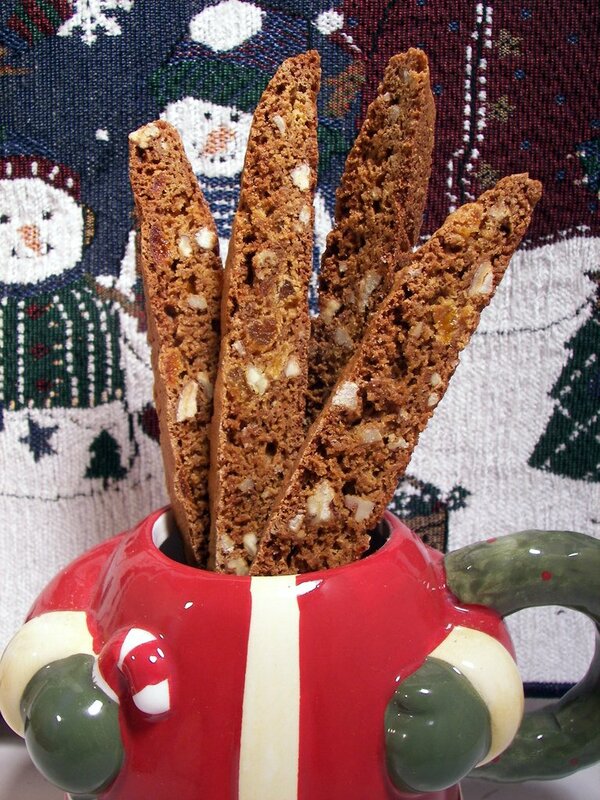 PS - I did get the recipe posted for the Gingerbread Biscotti! We've been asked a few times how many batches of each goodie we made from the gifts we sent out. It is all a blur right now, but we made at least 2 or 3 batches of each - though some of them we did at least 4. We brought over the gifts today to different friends and neighbors in the area here - they pretty much got the same things, except I made another cookie to put in their bags. I've never made anything like these Seven Layer Cookies before. There are a ton of steps, but as long as you take your time and have everything ready to go, it was actually a fun recipe to put together! The most stressful part was inverting the different colored layers on top of each other - I was afraid they would just fall apart! Thankfully, everything held together well and it came out ok. 2 thin layers of bittersweet chocolate, 3 layers of different colored almond-flavored extremely moist cakes and 2 layers of strained apricot preserves form the 7 total layers. On day one, the cookies had a pretty strong almond flavor - but on day two, the flavor was more mild and absolutely delicious! They definitely get better as they age. 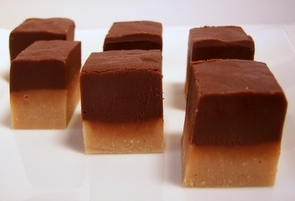 Cutting the thin layer of chocolate without cracking the surface is tedious and a bit tricky. We dipped a very sharp knife in hot water and dried it after every cut... so with a yield of over 5 dozen, it took forever to say the least. We both agreed it was well worth the effort and stress though - I'm not sure how 'authentic' they may be, but they are certainly going on the "must have every year" list! In the packages we mailed out yesterday, we did happen to include one item we did not make. We wanted to add something small, chocolate and a bit more adult. We stumbled upon these at Costco and decided we would give them a try and see. While we did give quite a few away, let's just say that after we had a couple, we decided to keep more than we sent out! When you bite into the smooth chocolate shell, an intense, rich and thick filling made from Baileys bursts into your mouth - very good stuff! I did actually get around to making dinner last night, but I was too tired to talk about it after posting the round up yesterday! So we'll talk about it tonight and just catch up with recipes over the weekend! 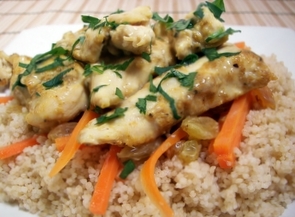 I'm glad I had already planned to make Curried Chicken with Couscous as it was a simple stir-fry that really didn't take much effort on my part. Quick cooking couscous infused with a hint of coconut from light coconut milk took just a few minutes to cook while I worked on the rest of the dish. Sliced chicken breasts are coated in a mixture of flour, curry powder, hot madras curry powder and salt. This is then stir-fried in a bit of hot oil until both sides are golden - then more coconut milk, julienned carrots and plump golden raisins are added. The coconut milk helps to keep the strips of chicken moist while it finishes cooking through. This also allows the carrots to get a little tender and the raisins to soak up some of the curried sauce. Simply served over the light couscous, this hassle-free meal only took about 20 minutes, but was still satisfying with a hint of spice. Because we used light coconut milk, the flavor is more subtle and does not overpower - just enough to make you take notice. Okay... I think I am officially exhausted! All of the goodies were packed and delivered to the post office this morning, despite us losing power for about 4 hours today! Here are the pictures of all the homemade goodies we sent out in our gift packs this year - the recipes are linked in the recipe title. Quite a few are ones that we have to make every year - but there are some new ones thrown in. There may be one or two that I have not had a chance to write up the recipe yet, but I will make sure to get that up in the next couple days - just hit refresh if you are looking to see if we updated it yet. Tomorrow we will be delivering the packages we made up for local friends and the neighbors. I'll post what we made/included in their packages tomorrow night! After that, I think I'm ready for a good 3-4 day nap... please? 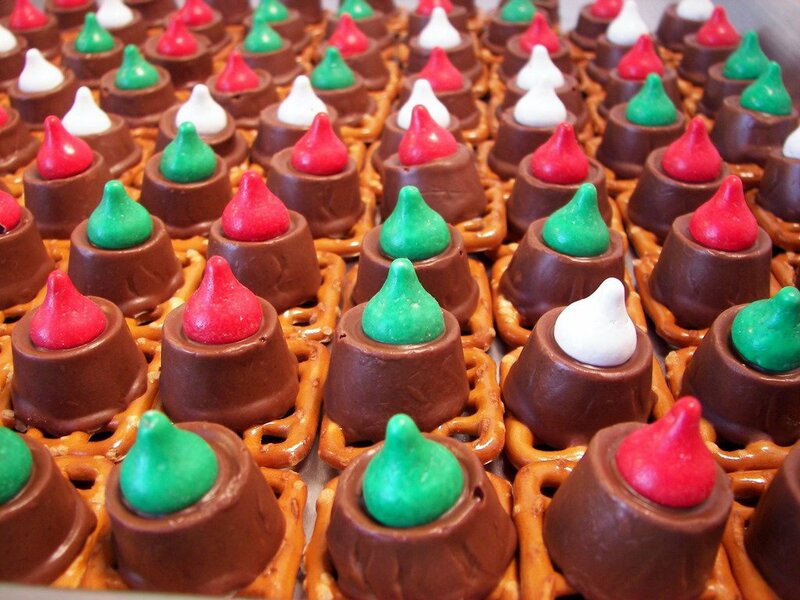 This is one of our favorite snacks during the holiday season - we always have to find the holiday shaped pretzels to use in it too! 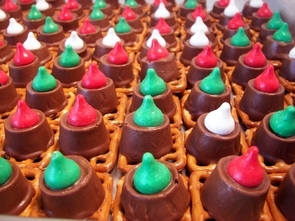 No recipe for these - just buttery checkerboard pretzels topped with a caramel laced rolo finished with kissables in holiday colors. 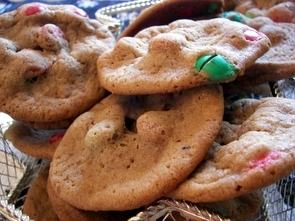 These are one of Jeff's new favorite crisp chocolate cookies - studded with those Ande's peppermint crunch chips. This is another one that we have to make every single year. The perfect combination of salty and sweet in mini bite-sized form! Small peanut butter ritz bits dipped into real white chocolate and topped in holiday sprinkles. We did the kisses a bit different this year - these crisp meringue cookies are still flavored with peppermint, except I painted red lines inside the pipping bag before filling it to create the colored stripes. 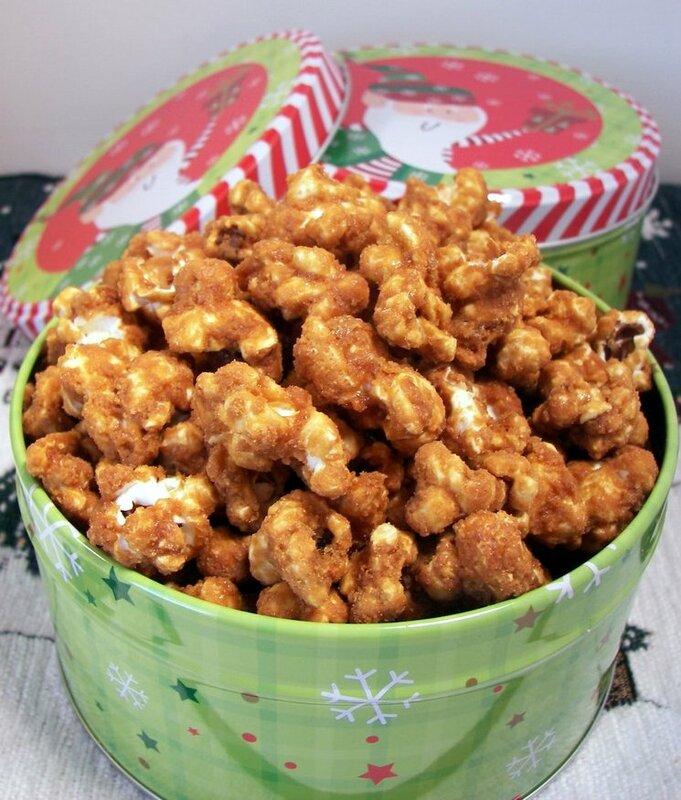 We both love this unusual brittle - instead of your favorite nut, crushed popcorn turns these crunchy snacks into a wonderful sweet treat! Jeff absolutely has to have these cookies each year - chocolate malt gives these cookies an edge over your ordinary M&M cookies. 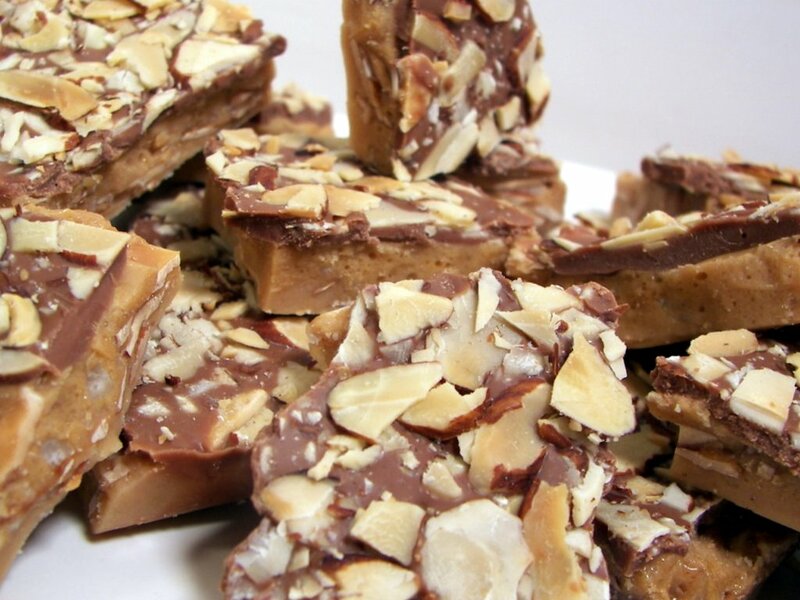 How could we not make our favorite new bark? We made this for the first time last year and will be making it for many years to come! I love the striking color difference in the layers and with a bonus of being able to be cut quite neatly! 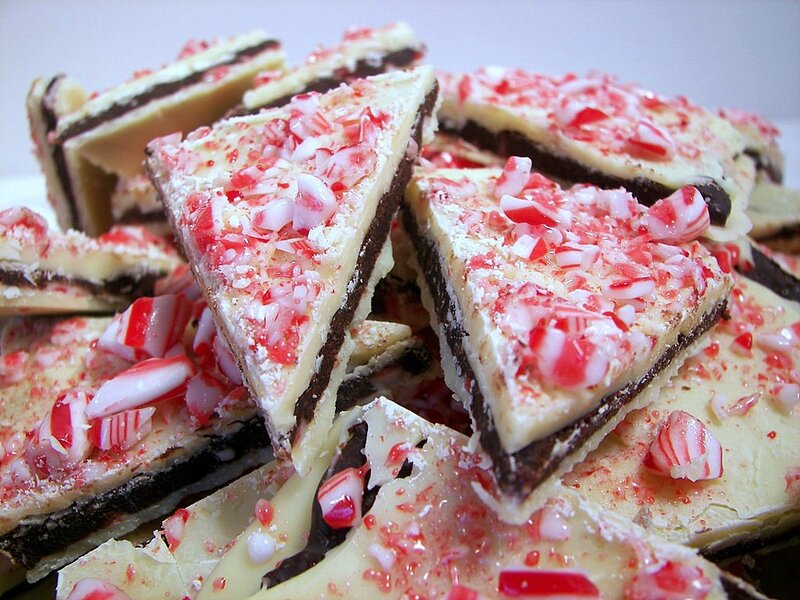 Rich, creamy and very peppermint-y! 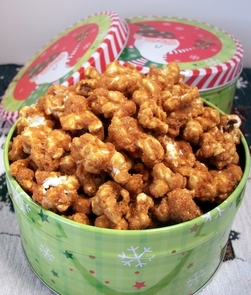 One of the more uniquely flavored baked popcorn mixes - sweet caramel and buttery toffee spiked with a large amount of ginger. One of the new recipes - crunchy biscotti flavored with spices found in gingerbread. Loved the addition of chopped apricots and nutty pecans. Fresh grated orange zest adds a fun background flavor which had people trying to guess what made these so good. Another must-have! 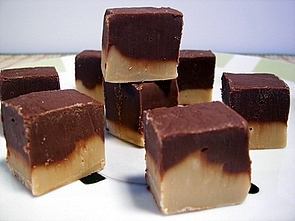 Smooth, creamy and you can't stop reaching for more of this addictive fudge! We can't include only one kind of fudge - we started making this a couple years ago and it is just different enough that we always get asked for the recipe. And finally... the crunchy toffee that we have made at least 5 batches of this season. Crazy good and so delicious. 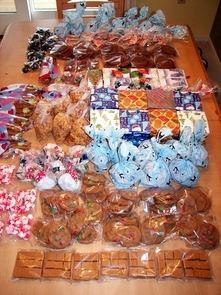 Here is the quick shot of everything packaged up before they went in their boxes. Whew! Too bad we are not quite done yet! In between baking cookies and cutting up fudge today, we have gotten most of the food gifts wrapped up and ready to be put in the boxes. The plan is to drop them off at the post office tomorrow and then we have a few more things to bake for the neighbors - then I get a break! I hope anyway... we have a bunch of photos to post in tomorrow's update with everything we have made so far! Since tonight's dinner was a little involved, I kept the side dish quick and easy. Apple Salad with Figs and Almonds is a simple combination of a sweet red apple, a tart green apple, a few dried figs, some crisp bits of celery, lemon yogurt, toasted sliced almonds and shredded carrots. Fresh, tangy and it was thrown together while dinner was simmering away on the stove. 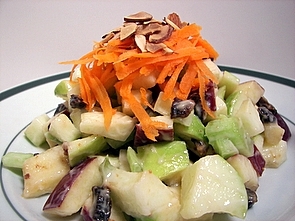 The crunchy apples and celery worked well with the texture and flavor from the softer sweet black mission figs. Sliced almonds and shredded carrots finished the dish with a nutty flavor and flash of color. Even though the weather was crazy here today with a high in the mid 70's, it cooled down enough tonight to enjoy some of the Spicy Hot Potato Soup we made. We first crisped up a few slices of smoky bacon and reserved a bit of the drippings to sauté some chopped carrots, poblano chilies, onions, jalapenos and garlic. Diced potatoes and chicken stock are added and allowed to simmer until the potatoes are tender. 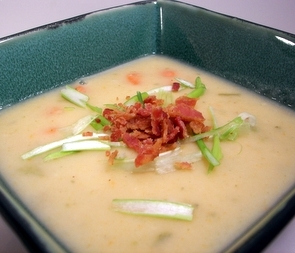 The soup is tightened up with a mixture of milk and flour - once bubbly and thick, jalapeno cheddar along with sharp white cheddar are melted in. A scattering of the crumbled crisp bacon sets the dish off with a salty note. I liked how this had more body and texture with the chopped carrots and chunky potatoes rather than pureeing the soup smooth. I didn't think the soup was super spicy, but there are layers of heat and flavor from the jalapeno and poblano with a final hit from the jalapeno cheese. 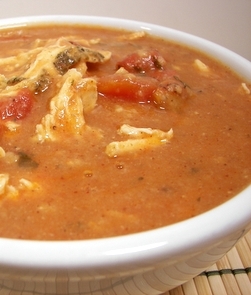 A good stomach-warming comfort dish. Huh? Where did my Saturday go!? Well, this is the first time I've had a chance to sit down - I think we will rename today from Saturday to Chocolate and Gingerbread day! 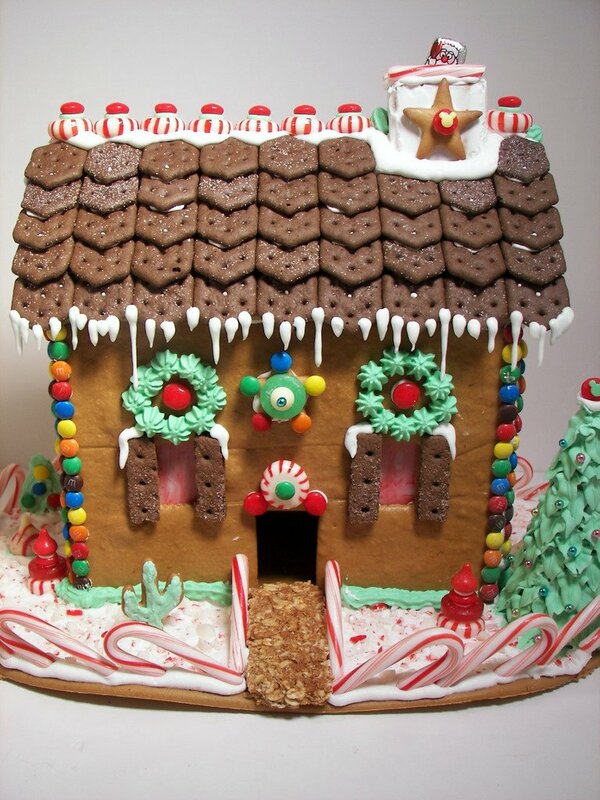 Jeff decided he would like to decorate a gingerbread house for the first time, so I've been making and cutting up gingerbread dough this morning. We used the time in between to get a bunch of our chocolate dipping done for the gifts we are sending out. We'll be posting this year's round up probably on Tuesday of this coming week! It looks to be a very large post so far! One item we make every year is one of Jeff's favorite fudge - Two Toned Chocolate Peanut Butter Fudge. While we did make it this year, we also made a fun variation and used some of the cappuccino chips instead of peanut butter. Jeff seems to be torn between the two, but he has been grabbing for the new cappuccino version more often! 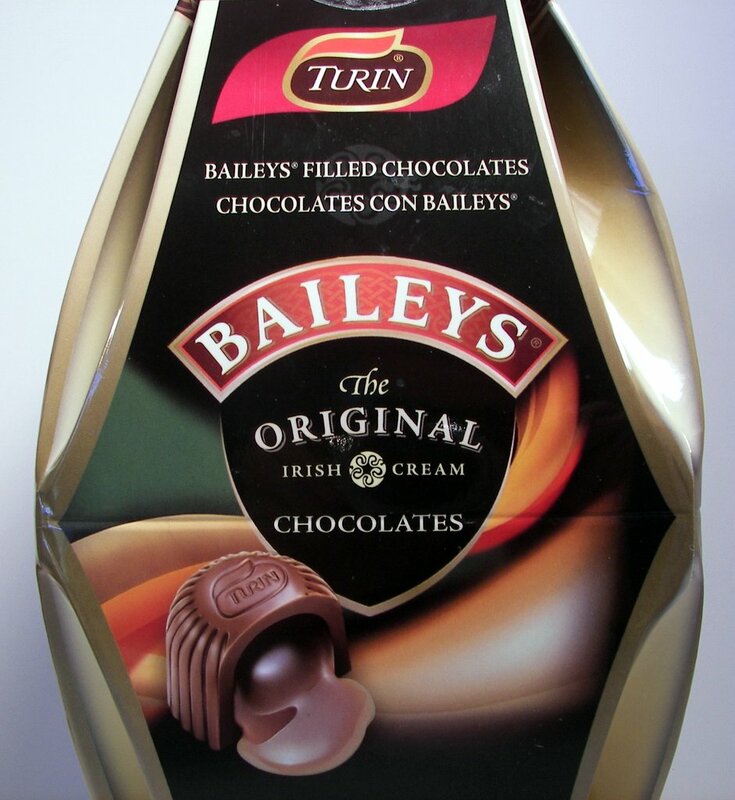 Smooth, creamy and delicious - the two flavors married together to form unique rich bites that make you come back for more. On Thursday, Jeff came home and told me to close my eyes as he had something to give me. When I opened them, I was surprised to see this! 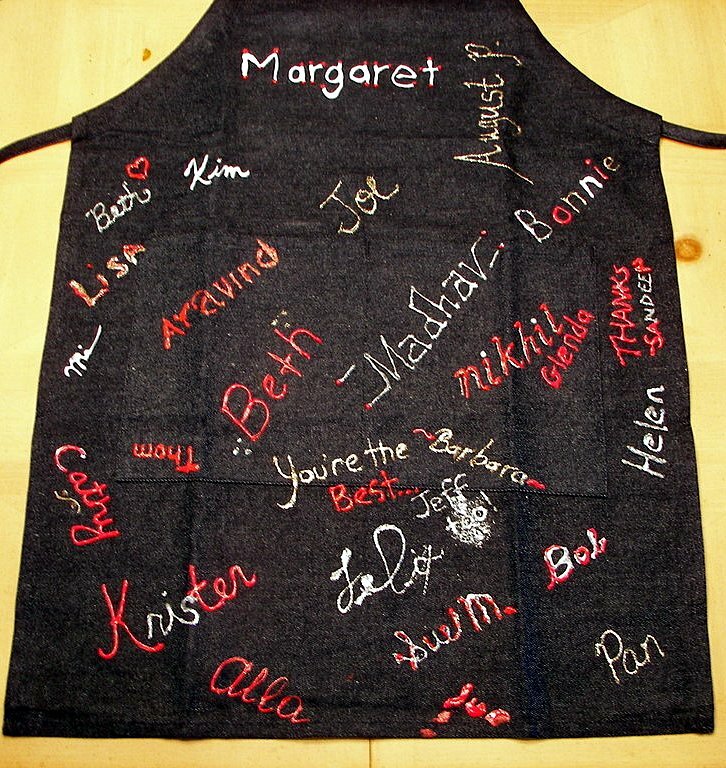 Jeff's co-workers all got together and made this awesome apron to say thanks for all the goodies we make to bring in on Wednesdays! Too cool! I just wanted to take a minute to say thank you and that I can't wait until after the new year to start baking more treats for you guys! 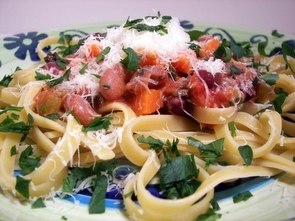 I debated back and forth over the past couple of weeks about making this recipe, Bean Bolognese, for dinner. Even though I've finally gotten Jeff to admit he actually does like beans, he is always a little apprehensive with new recipes that use them. However, neither of us will know if we like something unless we just give it a go... right? The recipe calls for a can of "salad beans" - I found this product at Common Market, a natural market we frequent, but you could just use your favorite variety of beans. This is actually just a combination of chickpeas, kidney and pinto beans for a variety of flavors and textures. In some olive oil, onions, carrots and celery are cooked until soft. Fresh garlic and a bay leaf are added, followed by a few splashes of white wine for flavor and to help loosen any caramelized bits on the bottom of the skillet. Fire-roasted diced tomatoes and fresh parsley are mixed in with a portion of the beans that we mashed. The mashed beans add a hearty thickness to the sauce as the juice from the tomatoes bubbles away. To stand up to this substantial sauce, we served it over burly fettuccine noodles and topped it with nutty fresh grated Parmesan cheese. This satisfying and veggie-friendly twist to a classic Bolognese sauce was just as good as one with meat - we were both surprised with just how much we ended up liking the dish! 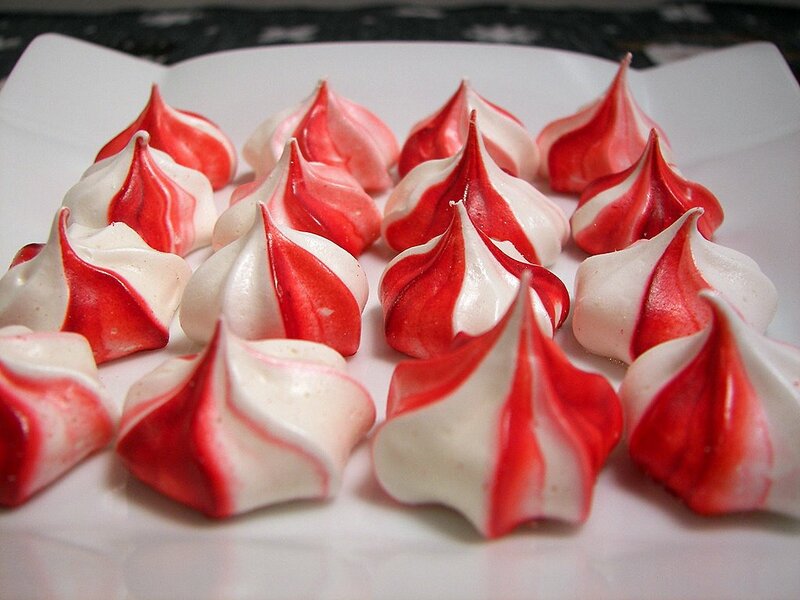 We are progressing well through all the recipes we are making to send out as gifts this year. We will do what we did last year - post which recipes we made and talk about them early next week when we send out the packages! 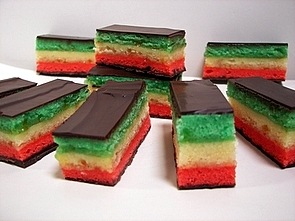 Although, if Jeff does not stop his "quality control" soon, we may have to remake a few recipes! 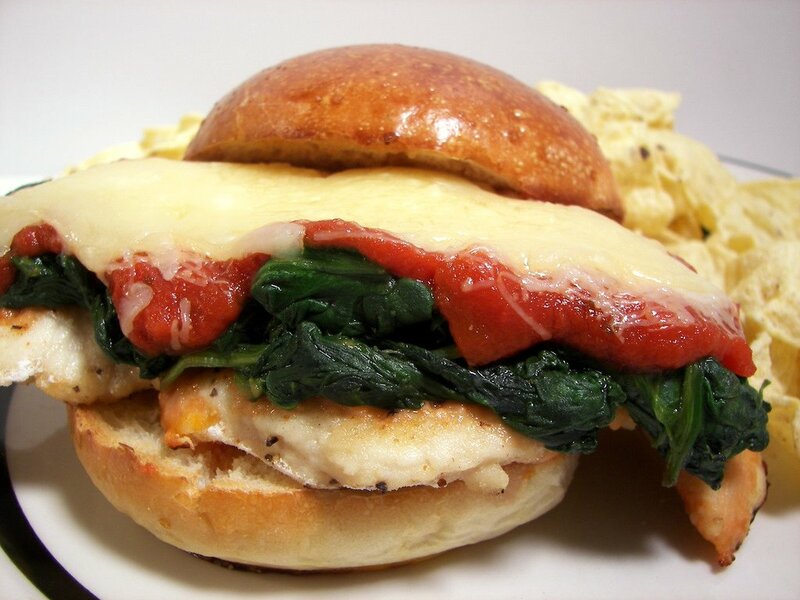 Tonight's dinner, Chicken Parmesan Sandwich, is an updated healthier version of a classic deli sandwich. Instead of a heavy breading, the flattened chicken breasts are coated in a lighter mixture of flour and seasonings. 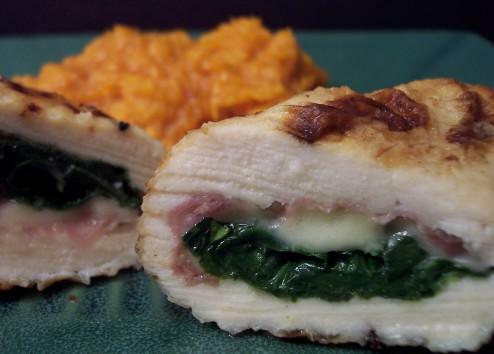 Before cooking the chicken, a mound of fresh baby spinach is cooked down and wilted. The spinach is removed and the chicken is then cooked in the same pan, in a couple batches, until golden and almost cooked through. The chicken is then placed on a baking sheet, smothered with spinach, marinara sauce, sharp Parmesan and shredded mozzarella. To finish cooking, they go under the broiler until the cheese bubbles and melts - just enough time to cook the chicken all the way through. I served them on our favorite hamburger buns - though, it did make the large bun look a little small! This was a good juicy sandwich and while it is a hearty portion, I think I would prefer a little more flavor in the coating of the chicken. Maybe some shredded Parmesan mixed in with the flour? I would also use a bit more oil in the initial cooking of the chicken to allow the crust to cook more evenly. 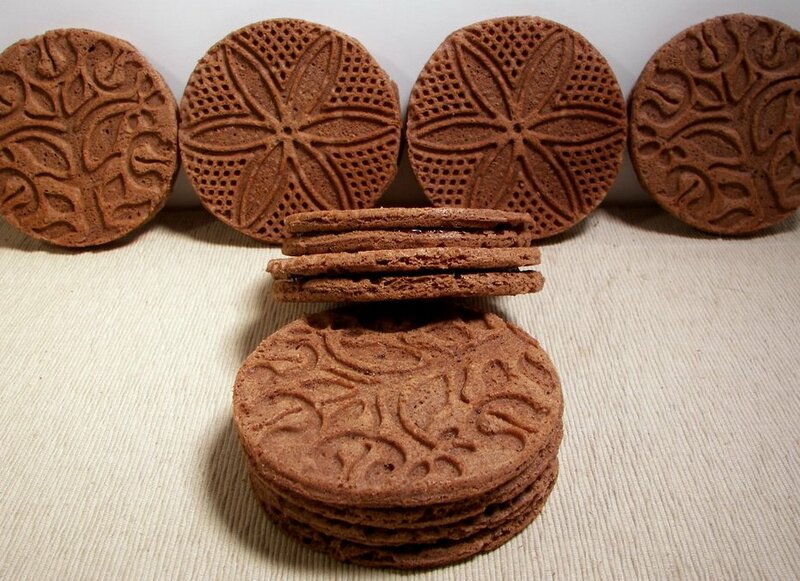 The other item for the Wednesday Treat Day that I made was these addictive Chocolate Peppermint Pizzelles. We've had a pizzelle iron for several years and have sadly only used it 2 or 3 times! 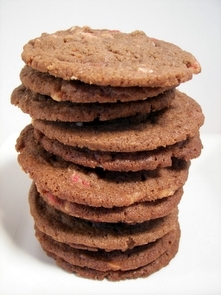 While I loved the cookies the last time we made them, I was glad to find a chocolate variation! We used Dutch-process cocoa for a smooth chocolate flavor, but you can use natural cocoa if that is all you have. 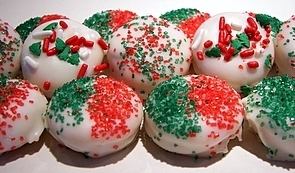 The cookies on their own were good, but since it is Christmas time, how can you not take them over the edge? A decadent combination of bittersweet chocolate and butter are gently melted together and combined with a few drops of peppermint extract for a fun holiday flavor. 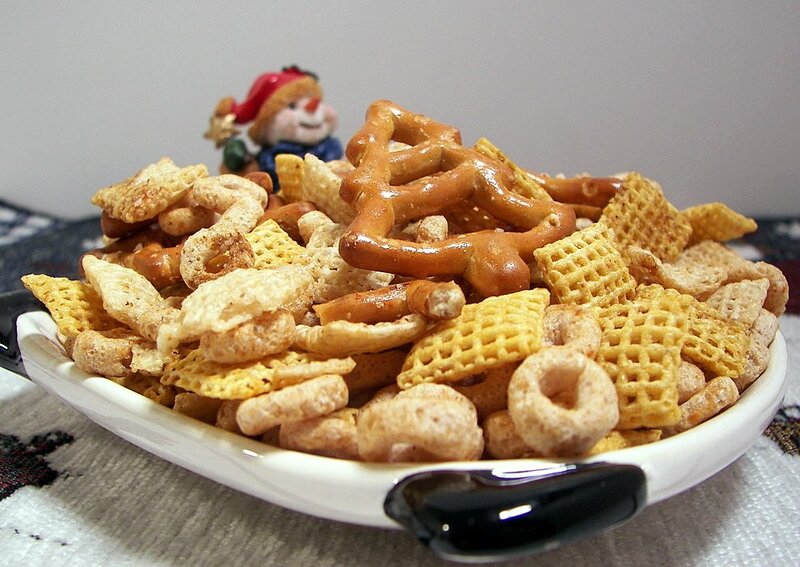 Half of these crisp gems are topped with the rich mixture and are then sandwiched with the remaining plain cookies. If you want to bring out the pattern a little more on your cookies, you can dust them with a light coating of confectioners' sugar before serving. If you're looking for an indulgent and very chocolate-y treat, these cookies are for you! Tonight's dinner may look a little like the croquettes we had on Monday, but the flavor is certainly different! These few simple ingredients, cauliflower florets, panko breadcrumbs, crunchy cashew butter and green onions meld together to create these lovely Cauliflower Cakes. The florets are first steamed until very tender so they can be easily mashed with a big ol' potato masher or even just a fork if that is all you have available. Once the chunky florets have been smashed into small bits, the other ingredients are stirred in to create a mixture that can be formed into small rounds. Coated in more panko, they are transferred into a hot skillet that has a layer of canola oil dancing around waiting to turn these white patties into golden crisp beauties. The cashew butter worked as a binder and added a unique nutty flavor that we both thoroughly enjoyed. Since I make my own nut butters, I kept it pretty chunky for this recipe - finding the nuggets of cashews in each cake was the best part. Jeff couldn't stay away from these... he insists that they remind him of onions rings from Burger King. While I think it has just been a long time since he had onion rings, they were certainly delicious however you want to describe them. Since Jeff has off the next two weeks for vacation, tomorrow will be the last Wednesday Treat Day of 2006 for his co-workers. 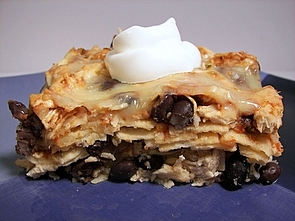 I made two recipes for him to take in; one, however, is a repeat goodie we have been making for a few years now, and posted about last year - but since we just moved out here it will be new to them! 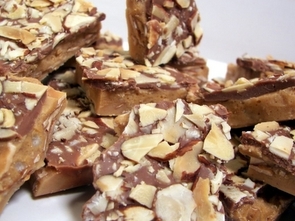 Just as buttery, decadent, crunchy and nutty as always - this Almond Roca does not last long in our gift baskets. 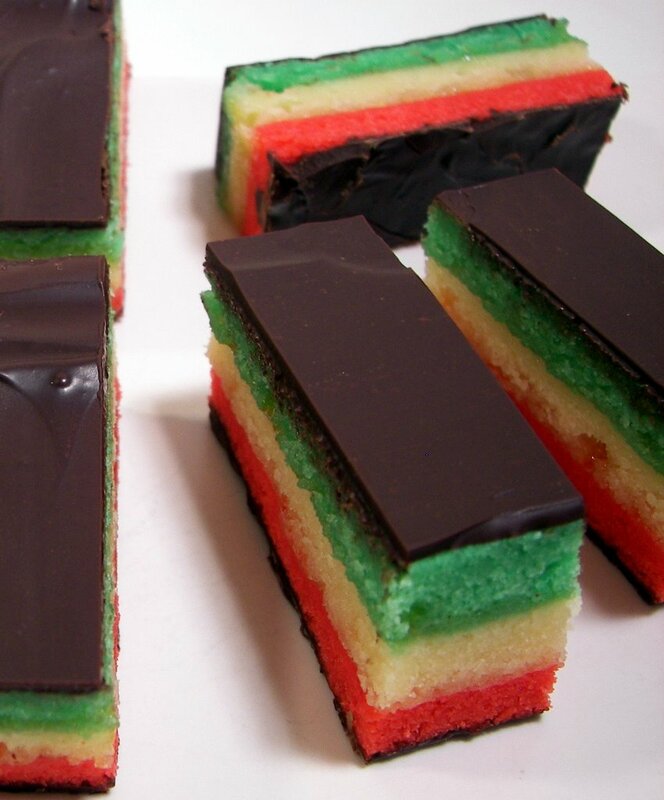 It may be a little tricky if you are not used to candy making, but as long as you are confident and take it slow, this recipe is worth the time, effort and cost. I'll post about the other treat day recipe tomorrow. I picked up some Cauliflower that was on a buy-one-get-one-free special this week at the market, so I've been looking for some new recipes to use them up. I'll do the first as a side tonight and use the other head in a main dish tomorrow. 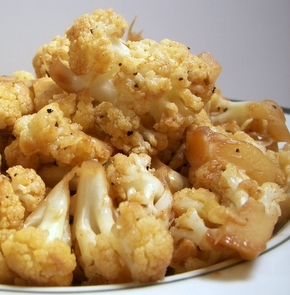 The side, Braised Cauliflower with Asian Flavors, turned into a refreshing and tangy way to serve up the vegetable. Hoisin, soy sauce, vinegar and water are mixed together to create a spicy and sweet glaze. The cauliflower is cooked in roasted peanut oil until the florets begin to take on a light golden color. Garlic, fresh ginger and green onions are added until you smell a fragrant sweet aroma. The hoisin mixture is stirred in to infuse them with an Asian flare and steam the florets until they become crisp-tender. Finished with salt and pepper to taste, this quick dish was a new way to spice up and enjoy this versatile veggie! It was another soup night for dinner with the recipe for a Tortilla Soup that had a lot of hype behind it. I've had this in my to-try pile for well over a year now and finally decided to give it a go since I had extra white corn tortillas in the freezer. Instead of a garnish of crisp tortilla strips, they go in at the beginning with garlic, cilantro and onions. Fire-roasted chunky tomatoes along with cumin, hot chili powder, a few bay leaves and some chicken stock are poured in and allowed to come to a boil. This mixture simmers to allow the flavors to meld and the tortillas to slowly start breaking up. By the time the soup is done, about 3/4 of the tortillas have dissolved to produce a wondeful thickened full-bodied soup. Cooked shredded chicken is added at the end to make this even more filling followed by a splash of fresh lime juice to enliven the dish. The fire-roasted tomatoes add depth while the cumin and chili powder compliment each other with a smoky warmth without overpowering. It may not be the most attractive looking soup, but it certainly surpassed the expectations put behind it! With using pounds of butter and sugar to get the gifts ready to send out next week, I've been looking to keep dinner on the lighter side. Instead of using our new favorite grain in a typical salad or tabbouleh, we took a different approach with Quinoa in the recipe tonight for these Quinoa and Potato Croquettes. Since you only need one potato in the recipe, it can be quickly and efficiently cooked in the microwave instead of bothering to boil or bake it. As you wait for the potato to cool and the quinoa to cook, green onions, cilantro, chopped jalapeno, smoky cumin, oregano, and garlic are sautéed until fragrant. The potato is peeled and mashed, then combined with the protein-packed quinoa, mildly spiced onion mixture, some sharp cheddar and a bit of drained cottage cheese. An egg is added to help hold the ingredients together and the mixture is then easily formed into large round patties. To ensure the outside stays crunchy, each one is dredged in a coating of panko breadcrumbs. 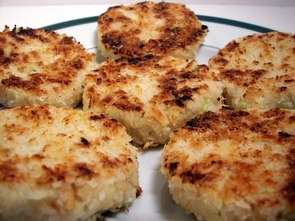 Since the rounds are a touch tacky, the panko easily grabs hold without the need to dip them in any liquid first. They first go for a quick chill in the refrigerator to make handling them a little easier - when firm, we slid them into a hot skillet until each side achieves a golden color. Warm, moist and creamy on the inside paired against the crisp outside, these croquettes are very filling with the addition of nutty quinoa. Be sure to use a full-flavored sharp cheddar, otherwise the flavor might get lost. Next time, I think I would add a bit more oil to the pan as it was pretty dry when I went to flip them over. 12 new recipes for this week - our favorites had to be the Vermont Apple Cider Donuts with Maple Glaze, Brown Beer Rye Bread, and Turkey Soup With Cheddar Dumplings. 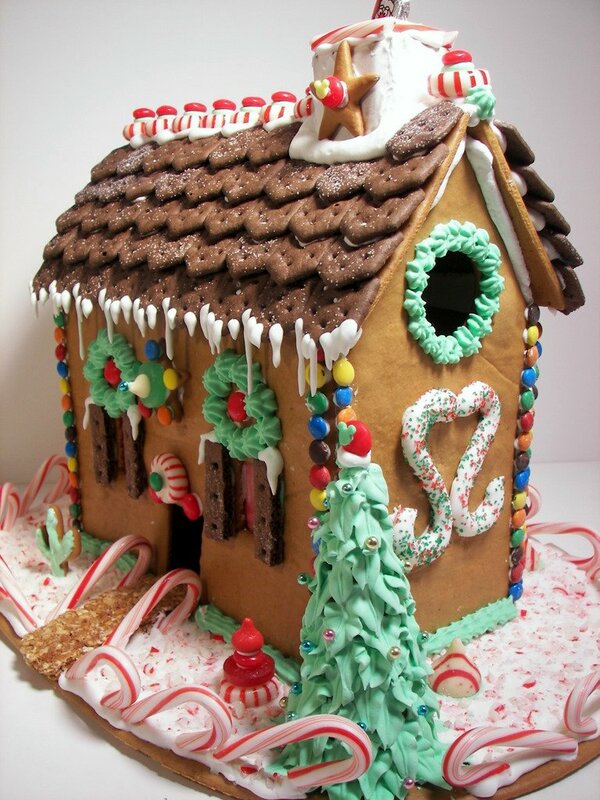 I'm not sure how many new recipes we will be making in the coming days, as most of my time will be making Christmas goodies, but I do plan on getting as many as I have already picked out made! 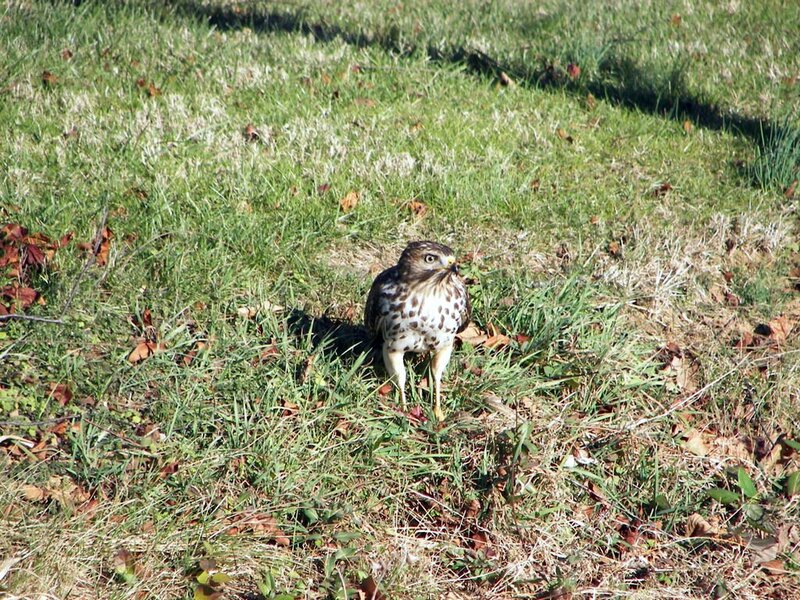 When we got home from grocery shopping this morning, can you believe we spotted this in the backyard?! 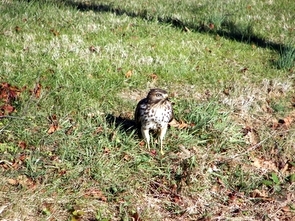 If you click on the picture to enlarge it and look down by the feet on the right side, you can even see the head of the snake that the hawk/owl (Jeff thought it was an owl, but we've had a couple comments that it is probably a hawk! Thanks for the info!) decided would be a nice snack today! Wow! I mentioned earlier in the week that we had a potato side dish to the flank steak recipe we made - Costco had a great deal on fingerling potatoes and I wanted to make a dent in the giant package. The recipe, Fingerling Potato and Prosciutto Salad, has few ingredients, but had both of us wanting more when we finished our portions. 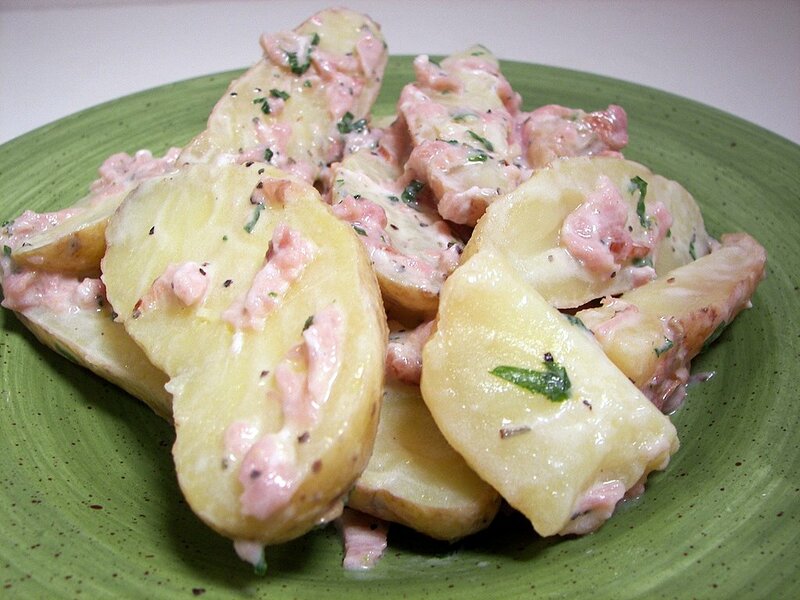 The skinny potatoes are halved and boiled just until tender - when they are done, they are splashed with a shot of vinegar and placed in the fridge while you make the dressing. Shallots, parsley, crème fraîche and sage are mixed together with diced prosciutto to form a thin coating on the potatoes. A bit of sourness from the crème fraîche with the generous portion of salty prosciutto brought these firm potatoes over the edge in flavor. 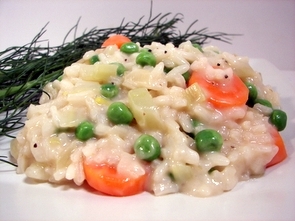 I will have to mark this one to have again during the spring and summer seasons for a light and refreshing side dish.